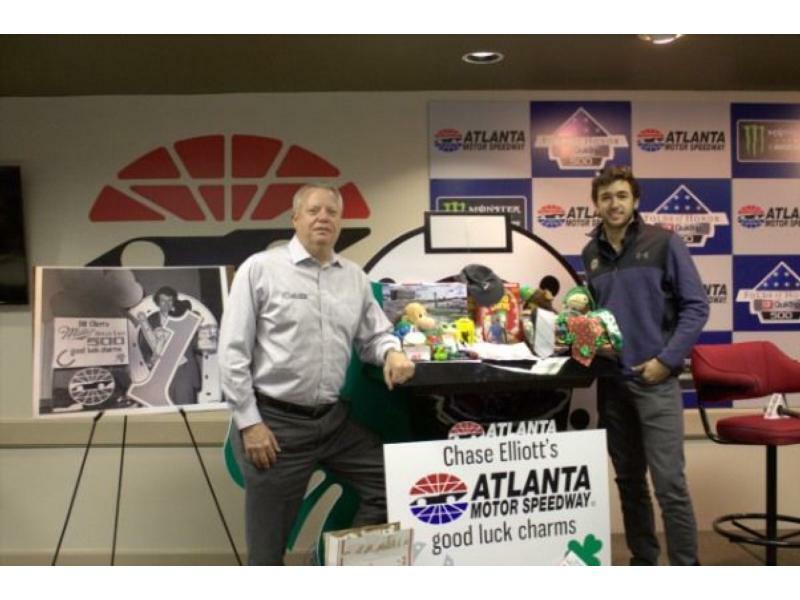 Chase Elliott, Georgia native and driver of the No. 9 Chevrolet Camaro ZL1 for Hendrick Motorsports in the Monster Energy NASCAR Cup Series, visited Atlanta Motor Speedway, his home track on the NASCAR circuit, Tuesday for a special media day and presentation of good-luck charms sent in from fans across the country as part of the recent "Good Luck, Chase" promotion put together by AMS. At just 22 years old, the third-year driver in NASCAR's top series enters the 2018 season on a high note after finishing fifth in the overall driver standings in 2017 and the top finisher among the four-car Hendrick Motorsports lineup. After 77 starts in the Cup Series, though, Elliott has yet to visit Victory Lane. 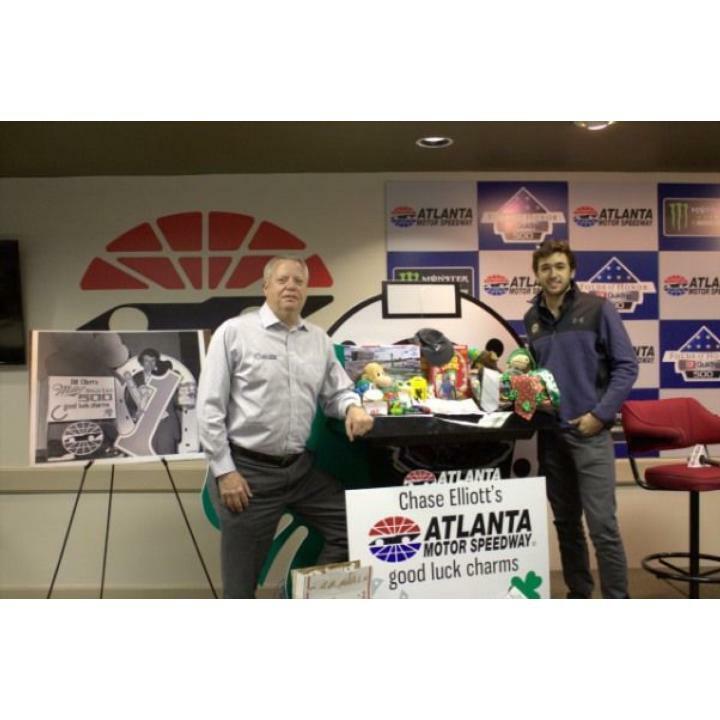 For an added measure of good luck in the 2018 season - and to help him into the Win Column - Atlanta Motor Speedway re-created a "lucky charm" promotion first introduced by Charlotte Motor Speedway in 1983 for Elliott's father, NASCAR Hall-of-Famer Bill Elliott, which helped him secure his first victory after 115 winless starts and eight second-place finishes to begin his career. Soliciting good-luck charms of all variety from fans across the country, AMS accumulated a mountain of trinkets, stuffed animals, four-leaf clovers, coins, rabbits feet and a plethora of other items and presented them to Elliott during a press conference Tuesday afternoon. "I'm glad everybody sent their stuff in. That's really cool," said Elliott. "I hope it works more than anything, but it is kind of funny. As I learned about this, I learned about Dad's beginnings and how many times he ran second before he won a race." The similarities between father and son at the beginnings of their respective careers are hard to ignore. And though he doesn't currently have any of his own good-luck charms, the younger Elliott seemed open to the idea if it helps him secure that first career win. "To be honest with you, I really don't (have any good-luck charms)," he said. "Not to say I can't find one at some point - there might be some right here, so we'll see." Some of the more interesting charms AMS received included lipstick, a porcelain figurine, mini die-cast race cars and a stack of personal letters. Elliott said he looked forward to finding the most unique one of them all. "When I get a chance to look through all of these, I'll get back to you, because I guarantee you there are some good ones." With his return to Atlanta Motor Speedway in the Feb. 25 Folds of Honor QuikTrip 500 less than two weeks away and a chance to score a win in front of his hometown crowd, Elliott said he looked forward to being back where both he and his father have so much history. Atlanta, a favorite track among many of the drivers in all three national NASCAR touring series, is commonly considered the place where the "real" NASCAR season begins. The first race without performance-governing restrictor plates, Atlanta is the first true test for both manufacturer and driver and a key measuring stick for how they'll measure up throughout the rest of the season in the more common downforce setup. "When we leave Daytona, we come to Atlanta, and I think we really get a better understanding of how you stack up," Elliott said. "This is more of a track like we're going to see the rest of the season. To be completely honest with you, I think you kind of have to wait until you get here and see where you stack up. "I hope that we stack up well and we've done our homework like we think we have, but sometimes you think you do things right and you don't. But I think until you get here and you really give it the full effort and not just at a test and everybody's bringing everything they have, you're not going to know until then, so we'll wait and see."